Some fear, others lobby for, unilateral action by the Obama administration on preserving wildlands. 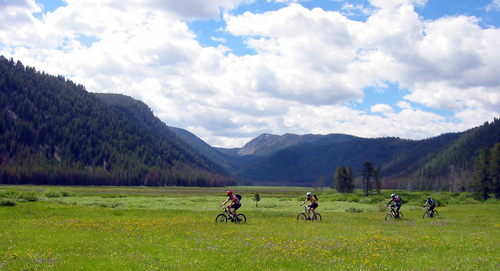 This image provided by Chris Cook shows mountain bikers crossing Warm Springs meadow on the Warm Springs Trail in the proposed Boulder-White Clouds wilderness area in central Idaho near Sun Valley in 2004. Mountain bikers would be barred from this area under a bill gaining steam in Congress. Since the 1980s, the legal definition of wilderness has prohibited mechanized transportation like ATVs, dirt bikes and, inexplicably to some, mountain bikes. 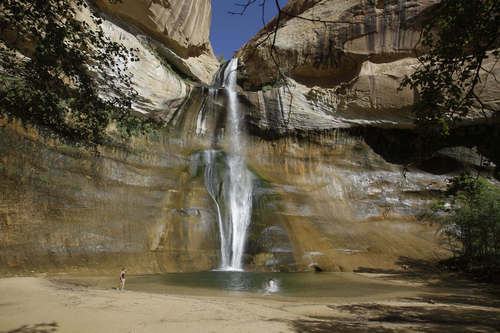 (AP File Photo/Chris Cook) Al Hartmann | The Salt Lake Tribune Creek flows through Canyon Rims area just north of U-111. It is an area up for consideration for inclusion into an expanded Canyonlands National Park. 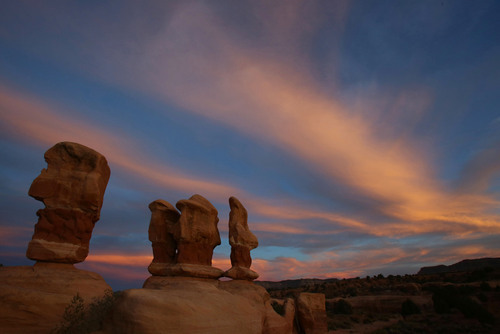 Francisco Kjolseth | The Salt Lake Tribune The sky transforms as the sun dips below the horizon surrounding the hoodoos of Devil's Garden in Grand Staircase-Escalante National Monument with color recently. Francisco Kjolseth | The Salt Lake Tribune The sky transforms as the sun dips below the horizon surrounding the hoodoos of Devil's Garden in Grand Staircase-Escalante National Monument with color recently. 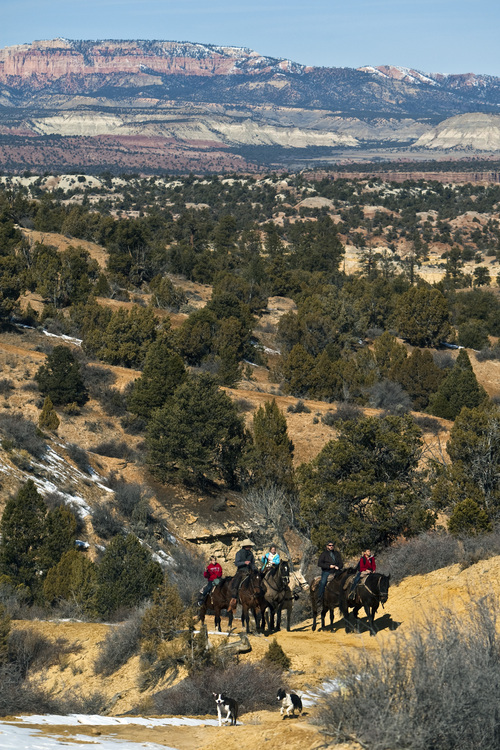 Chris Detrick | Tribune file photo Horseback riders go along the trail to Rock Springs Point along the west edge of the Grand Staircase-Escalante National Monument Saturday February 18, 2012. Al Hartmann | The Salt Lake Tribune Canyon Rims area just north of U-111 is an area up for consideration for inclusion into an expanded Canyonlands National Park. Leah Hogsten | Tribune File Photo A view of the Sand Rafael Swell looking east through Cistern Canyon. Located in southeastern Utah, Emery County is 4,452 square miles of red rock canyons, mountain meadows of sagebrush and wildflowers, desert wilderness, slot canyons and unforgiving badlands. 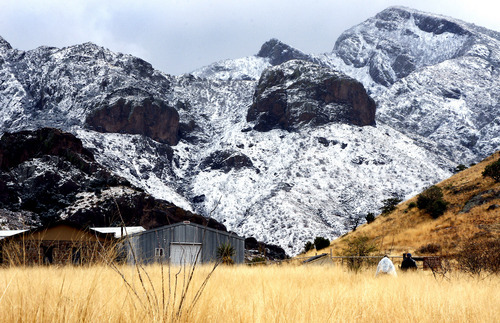 Settled in 1877, the county is colored with ancient Native American artifacts and rock art, dinosaur bones, outlaw hideouts and abandoned Uranium mines. Photo by Leah Hogsten 2/16/06 Emery County Al Hartmann | The Salt Lake Tribune Canyon Rims area just north of U-111 is an area up for consideration for inclusion into an expanded Canyonlands National Park. 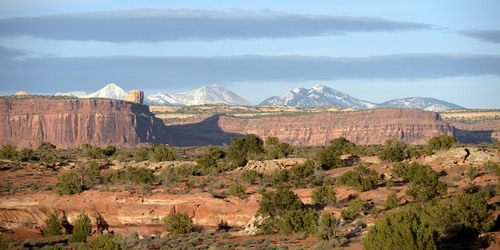 La Sal Mountain range lies far to the east. Francisco Kjolseth | The Salt Lake Tribune Every step can reveal an interesting new find in the Grand Staircase-Escalante National Monument where the geologic transformation of the planet seems to be more visible. 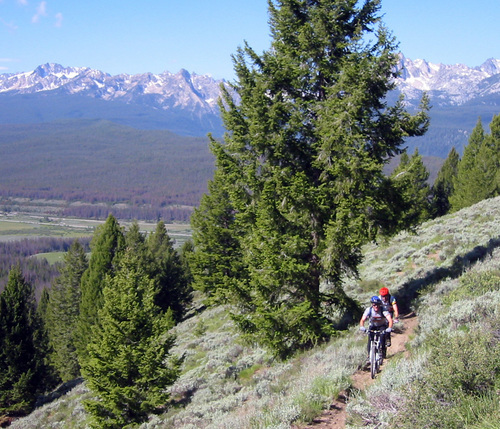 This image provided by Chris Cook shows mountain bikers traversing the Boundary Creek Trail on the ouskirts of the proposed Boulder-White Clouds wilderness area in central Idaho near Sun Valley in 2004. Mountain bikers would be barred from this area under a bill gaining steam in Congress. Since the 1980s, the legal definition of wilderness has prohibited mechanized transportation like ATVs, dirt bikes and, inexplicably to some, mountain bikes. 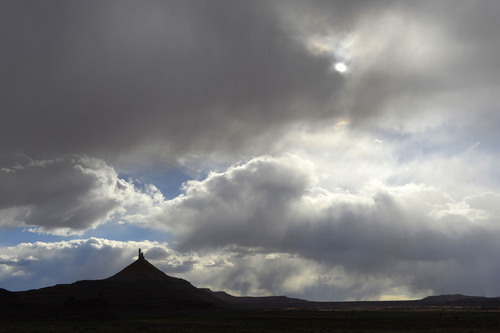 (AP File Photo/Chris Cook) Al Hartmann | The Salt Lake Tribune North Six-Shooter Peak is cast in shadow as a Spring rain sweeps over the Canyon Rims area just south of U-111. It is an area up for consideration for inclusion into an expanded Canyonlands National Park. Leah Hogsten | Tribune file photo The Wedge Overlook in the San Rafael Swell. San Rafael Swell 5/15/10 Two hikers make their way up the Dripping Springs Trail on Tuesday, Dec. 9, 2008 to get a closer look at the rare and picturesque view of the snow covered Organ Mountains in Las Cruces, N.M. About one quarter of an inch of snow blanketed the ridges, according to Laurie Schattler, a volunteer at the Dripping Springs Visitor Center. 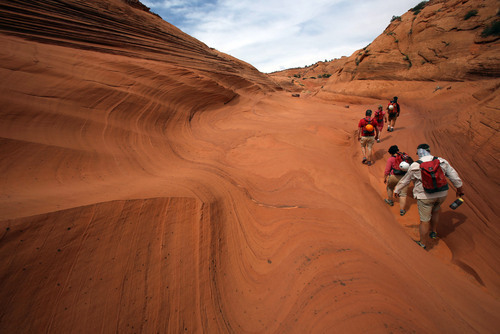 (AP File photo/Las Cruces Sun-News, Shari Vialpando) Walking between mineral-streaked cliffs of Navajo Sandstone, hikers pass beaver ponds and pre-historic rock art sites enroute to the 126-foot-high Lower Calf Creek water falls shown in the Bureau of Land Management's Calf Creek Recreation Area in Grand Staircase Escalante National Monument in southern Utah, Aug. 30, 2011. 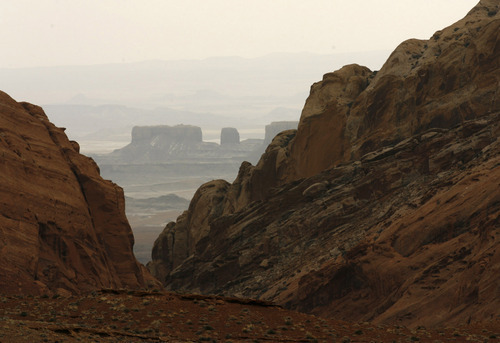 (AP Photo/Carlos Osorio) Leah Hogsten | Tribune File Photo The Wedge Overlook in the San Rafael Swell on May 15, 2010. Gov. Gary Herbert doesn't think President Barack Obama will declare more monuments in Utah. Washington • Just south of Canyonlands National Park, the redrock wonders merge into a scrubland oasis with a peak that juts 11,000 feet into the sky. Mesas and buttes provide panoramic views and canyons, and ancient cliff dwellings offer a unique retreat. It&apos;s a region that holds sacred and historic value to the Navajo Nation, which has pitched Congress on creating the Diné Bikéyah National Conservation Area to protect the 1.9 million acres in San Juan County from development. But as with most things involving Congress, inaction has been the order of the day. Even as supporters of a conservation area remain hopeful, they&apos;re ready for Plan B: Asking President Barack Obama for a national monument. 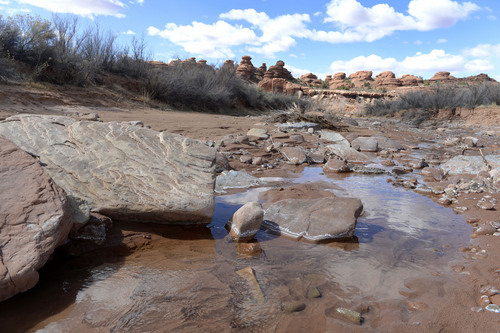 Willie Grayeyes, and other members of the nonprofit Utah Diné Bikéyah, traveled recently to Washington to lobby Interior Department officials to designate the region north of the San Juan River and just outside the Navajo Reservation as a monument. "The Utah delegates are only fumbling the ball. They aren&apos;t really tackling it," Grayeyes said. A monument is a logical fallback to congressional designation, under which many of the current uses could continue. Obama already has named a handful of monuments across the country  using his unilateral power under the 1906 Antiquities Act  and has promised more. "I&apos;ll use my authority to protect more of our pristine federal lands for future generations," he said in his State of the Union address earlier this year. That commitment has some in the West fearing more intrusion by the federal government into their backyard, undermining locally driven efforts to decide the future of public lands. That fear isn&apos;t without precedent. "It makes me worried that [the president will] just ignore the wishes of the people of Utah and just do what he wants to  like Clinton did," Sen. Orrin Hatch, R-Utah, said in a recent Salt Lake Tribune interview. "Sometimes he does act unilaterally." Environmentalists hailed the action as long overdue to preserve these unique and pristine lands. Momentum may be accelerating for Obama to pull a similar move. Since 2010, Congress has passed only one bill designating wilderness  32,500 acres of sand dunes in Michigan  while others have stalled, even those with local support. That includes 13,000 acres proposed by Rep. Jim Matheson, D-Utah, to protect the Wasatch watershed. In the absence of congressional action, environmentalists and some Democrats are urging Obama to go it alone. The push • In January, 109 members of Congress  all Democrats  argued in a letter to the president that he has no choice but to use his power to name national monuments to protect treasured lands before they&apos;re gone. The 2010-2011 sessions of Congress had been the first in four decades not to set aside a single acre of wilderness, the members noted. "Some initiatives require presidential leadership," they wrote, "and should not be bogged down by political infighting and paralysis, increasingly common characteristics of Congress." Rep. Raul Grijalva of Arizona, the top Democrat on the public-lands subcommittee, says it&apos;s time for Obama to act, and if he named five or six monuments that had some local buy-in, he wouldn&apos;t face a backlash. "I don&apos;t know if he&apos;ll do any now before the midterm [elections], but after that I think you&apos;ll see the preparations in earnest," Grijalva said in an interview. 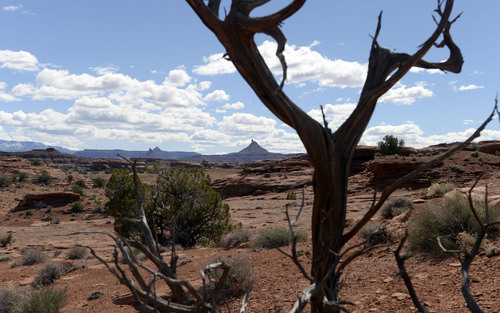 Four of the five national parks in Utah started out as national monuments declared under the Antiquities Act, notes Jen Ujifusa, the legislative director of the Southern Utah Wilderness Alliance. "History has shown that every time presidents protect the special places that we have in Utah, it&apos;s an economic boon for the state; it makes the state look good," Ujifusa said. "Posterity does smile on these designations, and we wouldn&apos;t have our mighty five national parks if we hadn&apos;t had forward-thinking presidents of both parties who recognized the beauty we have in Utah." Republicans in Congress, though, are trying to tie any president&apos;s hands in making such declarations going forward. The House passed a bill by Rep. Rob Bishop, R-Utah, that would force any large monument designation to go through an environmental review and add a one-per-state-per-presidential-term limit. Several other measures  including one by Rep. Chris Stewart, R-Utah  would exempt states from the law, carve-outs that Alaska and Wyoming now enjoy. "Teddy Roosevelt may have tried to save places, but, since [Jimmy] Carter, presidents have used this for political purposes not to try and preserve something," Bishop said. "We need to change that process." Former Interior Secretary Ken Salazar warns that tinkering with this presidential power would be dangerous. "What the House of Representatives did [in passing Bishop&apos;s bill] was wrongheaded," Salazar said recently, "and I think it would be opposed by any president, whether the president happens to be Republican or Democrat, because it&apos;s a significant intrusion into the long-standing authority with presidential powers that has been used effectively by Republicans and Democrats in office." The Colorado Democrat, now in private practice, understands the frustration of folks who want Obama to set aside public lands and declare them off-limits to development. "I think that would be great," he said. "I would urge [Interior Secretary Sally Jewell] and the president to do it." There is no shortage of candidates. Long list • In February 2010, Bishop unearthed a draft Interior Department memo that listed 14 potential new national monuments and the arguments for why the administration should preserve them. 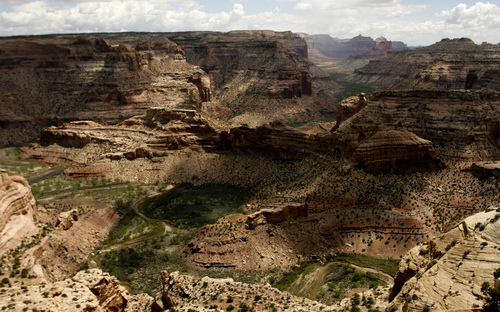 That included two in Utah: San Juan County&apos;s Cedar Mesa and Emery County&apos;s San Rafael Swell. The memo cautioned that "further evaluations should be completed prior to any final decision, including an assessment of public and congressional support." Backing was definitely absent as Salazar was called before Congress to explain. He said there was no "hidden federal agenda" and the memo was just a form of thinking out loud. The list, though, contained many areas that observers on all sides agree could conceivably be singled out for monument designation: the two from Utah, as well as Greater Canyonlands, the San Gabriel Mountains in California, Boulder-White Clouds in Idaho, the Organ Mountains in New Mexico and Tule Springs in Nevada. Bishop recently toured Tule Springs with local officials hoping for congressional action. Failing that, it could be on Obama&apos;s legacy list. Jewell said recently that the administration is still focused on working with local officials on public-lands issues but that if Congress slow-plays, or sits on timely issues, there may come a time when the president has to step in. She noted that some local areas actually lobby for a presidentially named monument because it brings more attention, tourism and economic development. Still, she added, she supports Bishop&apos;s effort to bring parties together to solve regional public-land disputes. "Sitting down at a table constructively, working together, understanding the local view is a very constructive path forward," she said. Those words are nice to hear but don&apos;t make up for Obama&apos;s State of the Union comments. San Juan County Commission Chairman Bruce Adams says designating the Diné Bikéyah area as a national monument against the community&apos;s wishes would be as controversial as the Grand Staircase announcement was in Garfield and Kane counties. "It will not be received well," Adams said. "It will look like overreach on the part of the administration, more federal intrusion into the lives of the people who came here to pioneer a part of the country no one wanted." I On May 14 at 7 p.m., The Tribune&apos;s Jennifer Napier-Pearce will moderate an Oxford-style debate between three Utahns in support of current federal lands policy and three in opposition. Once the two sides have debated, the live audience will choose a winner. The debate is free and open to the public at the Salt Lake City Main Library, 210 E. 400 South. KCPW 88.3/105.3 FM will broadcast it live, and it also will be streamed live at sltrib.com.